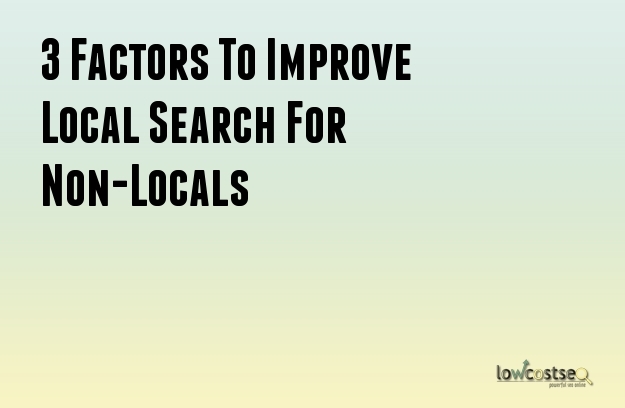 Local searching is a great area of SEO for location-specific businesses. If you’re a restaurant in London, the right website optimisation ensures people in Manchester aren’t mistakenly directed to your page (unless, of course, they’re planning for something in London itself). Through targeting long-tail keywords, you can build up traffic with a much better bounce rate. Yet, while this is good for locals, how do you pertain to people coming in from out of town? Using the above example, what can be done to target a couple from Manchester looking for food in London? There are many businesses which can benefit from people travelling through an area, or even those who are just new. Key to any local search success is clearly indicating where your business is located. This is part of your wider NAP listing, which stands for your Name, Address and Phone Number. People need to see where you are and, if they can’t tell this straight away, it’s just easier to look elsewhere. For non-locals, however, you may have to offer directions by large landmarks. If your shop is 2 streets off of the High Street, mention that it is 2 minutes from the High Street on your website – this removes the doubt of getting lost and, again, focuses on the location. If you’re on a road, driving directions from the motorway or main road would also be a good idea. Local listings can offer some SEO potential but their main use is to help people who are in need of something specific. If you’re in the food business, for example, there are many food websites people use to find reviews and make the best choice. This is also true for tradesman and other industries. Someone new to an area won’t know any local information, so they may often fall back on these platforms for added support in their choice. While this isn’t going to boost you up the local SERPs, it’s nonetheless vital for traffic. Find some high quality services (such as Yell or Trustpilot) and make sure you have a strong presence on there. This may mean asking your existing customers to publish more reviews (with a little encouragement, of course). Reviews, of course, are a great way to get the word out, but so too is social media. If you’re active online, you may be able to find discussions taking place in regards to new customers. Having an active brand presence ensures you’re never forgotten about. People can use this interactivity to make a quicker choice, knowing that you are available if needed. Improving your local search for newcomers is, of course, a very small niche, but it is something that many businesses might find vital nonetheless. So long as you attribute your website correctly (ensuring the local information and NAP data is clear) and spread your brand on some additional channels, you can help make your business all the more visible.